Of Whom Are You Speaking? My 4 best friends on the trail will be my pack, my tent, my sleeping bag, and my sleeping pad. If everything goes to plan these will in fact be my best friends and not my worst enemies. These 4 items are often referred to “the big 4” when taking about pack weights. They are crucial to every hike. My hiking style resonates with my lifestyle, simpler is easier. So naturally I would categorize myself as #ultralight. This is also something that I have focused in on over the years and have put in the time, effort, and money to reduce my pack weight. For this entry I will be going over my more prominent gear selections for the CDT. I have outlined my gear in my gear list, but I would like to go a little more into depth about my big 4. The big 4 are called that for a reason. They take up the most space in your pack and weigh the most. There is a lot of opportunity to save weight with these 4 items as long as the rest of your pack layout is simple and straightforward. A happy camper at Harts Pass, Washington. Disclosure: On my 2016 PCT thru hike I was on the “Vasque Thru Hike Syndicate” in which I received a lot of free gear in exchange for exposure and gear reviews. I was supplied with a generous amount of gear from Vasque, Darn Tough, Nemo, Leki and Osprey. Upon mentioning these items I will give my truthful thoughts about the products, but Just be aware I received it for free. Furthermore, on the CDT I will be representing Waymark Gear Co as a trail ambassador. I received discounts from them, but I will still provide an accurate representation of the gear. 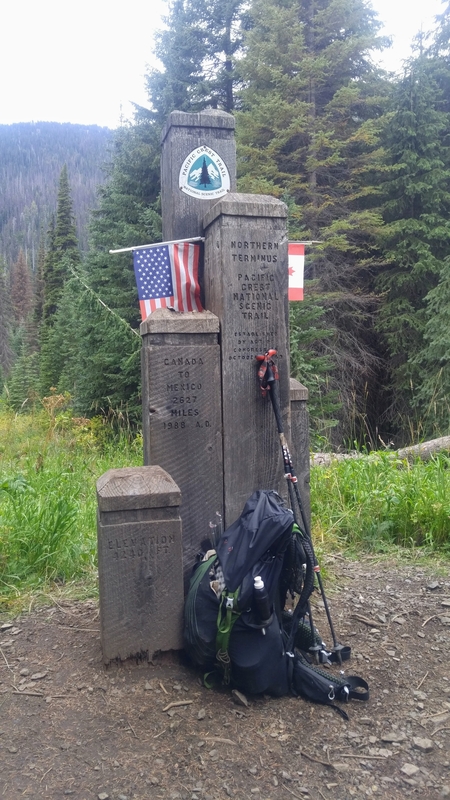 For the AT and PCT I carried the very popular Osprey Exos 58 Liter. The Exos did well and I enjoyed carrying it. It had all the right features for me and my previous thru hikes. For those two thru hikes my base pack weight was around 12 pounds. However, once I reduced my base pack weight to a certain point it was too large and weighed too much. I believe at most times I had about 10 liters of internal space that was going to waste. This, obviously, wasn’t very efficient. The Exos also has a multitude of features that started to annoy me. I stripped each pack down and tried to get of excess features and the weight they carried. As my gear progression continued I wanted a pack that was similar and lighter. I ended up doing a lot of research into the frameless pack world. My goal was to wear a similar pack and to cut weight from my Osprey Exos. This led me to Waymark Gear Co, they made packs out of Utah. They also have options to create a custom pack, which I was stoked on. I settled with a custom built Waymark Gear Co Thru 40L pack. This thing is a beauty and I am really excited to carry it. I also feel very lucky that I will be a trail ambassador representing Waymark this year. 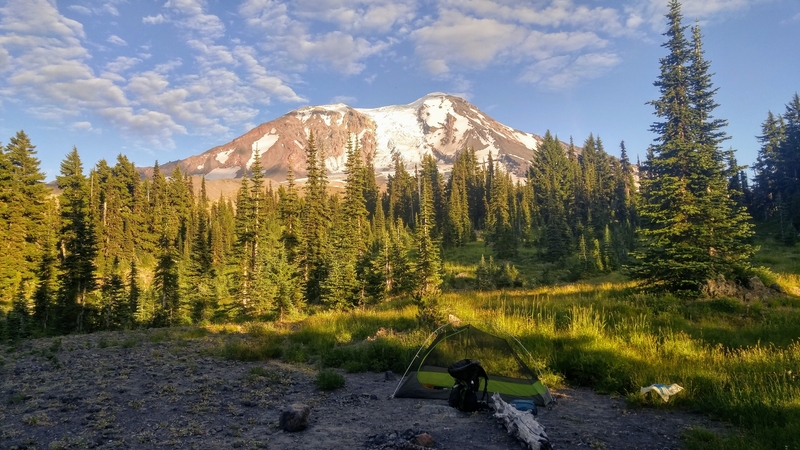 I am looking forward to seeing this pack take on the CDT and hopefully I can provide a complete in depth review down the road, or trail, rather. 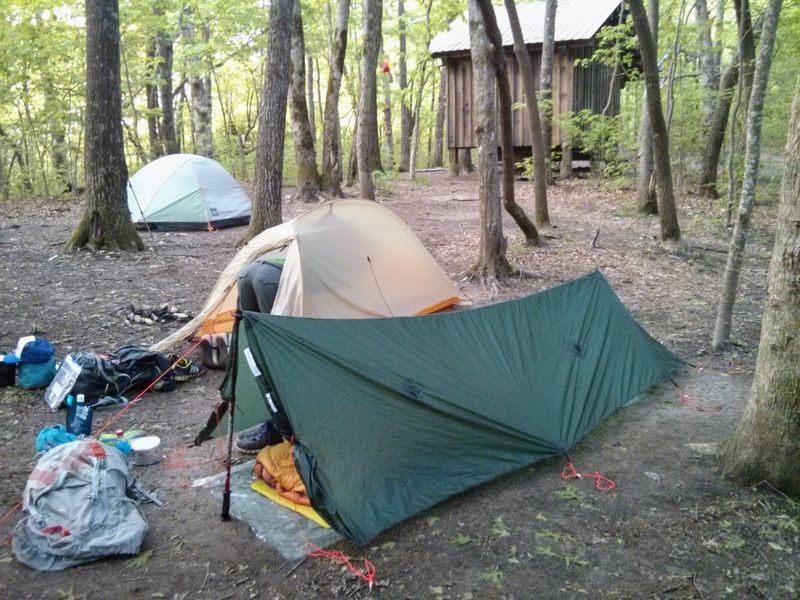 On the AT I started out with a tarp set up, but ended up hating it. I had to buy a bug net bivy on trail to deal with the bugs. Then I felt a completely claustrophobic in that thing so I never slept well. In Kent, Connecticut I ended up ordering a REI Quarter Dome 1 Person tent, because I was absolutely sick of the tarp thing. I didn’t care that it weighed more. So I have had some negative tent experiences and now I know my shelter needs. 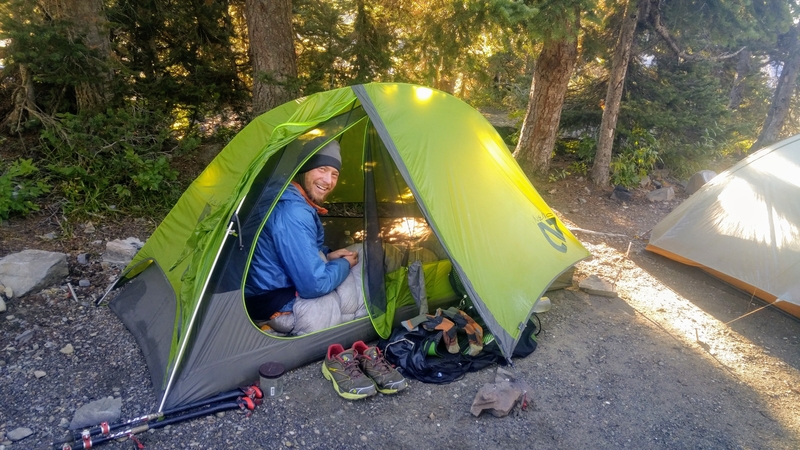 On the PCT I carried a NEMO Hornet 1 person tent and I loved it. I knew I would need a tent for the PCT just so I could sleep well. It weighed just under two pounds, and is comparable to the popular Fly Creek from Big Agnes in terms of weight. However unlike the Fly Creek, the Nemo tent has side entry! Which is a nice feature and it doesn’t make you feel like you are crawling into a dog house every night. Nemo did have to use some pretty thin silnylon to achieve it’s feather weights. I did get a couple of small holes in it along the PCT, which is not surprising. The hornet treated me well, I will use it in the future when my new shelter seems inappropriate. Nemo Hornet 1p and Mt Adams in the background. PCT 2016. I have been lusting after cuben shelters for years. If you know cuben shelters then you know ZPacks has been the top dog for many years in this category. After a lot of debate I settled on a Zpacks Hexamid Solo. I am really excited about this shelter. For one, I will be saving an entire pound from my Nemo Hornet tent. It is also completely enclosed with bug netting, but lacks a real floor. I have a piece of polycryo plastic as a floor and I will be carrying a single trekking pole to provide the structure to the tent. The fact that this is a fully enclosed shelter should mean that I will be able to get enough rest while not worrying about the bugs and other things that crawl around at night. I also upgrade my Hexamid and purchased the .74 oz/sq.yd. cuben version, a little beefier than the default .51 oz/sq.yd. cuben. Z Packs Hexamid Solo .74 oz/sq.yd. Weight: 17 ounces, including shelter, groundsheet and 8 stakes. For some sleeping cushion I will be carrying an old ¾ length Thermarest Neo-Air. This thing has been through thousands of miles and I hope it can go one more thru hike. Unfortunately, I am a side sleeper, I really wish I wasn’t, but an air mattress is a necessity for that reason. I will also be carrying a portion of a foam Z-Lite pad to insulation my legs from the cold since it is not a full length air mattress. The Z-Lite will also be used to provide a little structure to my pack. Pros: It is pretty thick and comfortable, it doesn’t make noise like the newer Neo-Airs, and it takes less breaths to inflate than a full length pad. Cons: I would not be surprised if it needs replacing along the way. I am going to try and make due with what I have for sleeping bags. On the PCT I got away with carrying a Nemo 30° quilt and a liner. However that is not going to work for the CDT, this trail is a little colder than the PCT and AT. I am still debating what I am going to start out with. I may be able to make a 30° bag work for New Mexico, but maybe not. Time will tell. Anyways I will be having to my trusty ol’ Mountain Hardwear Phantom 15° bag past New Mexico. This thing is pretty old, but I know I can trust it. I can also burrow down into it and hide from the cold. I am open to purchasing a 20° quilt this summer if I need too, I have been eyeballing Katabatic and Enlightened Equipment quilts. My deflated Osprey Exos at the end of the PCT. The big 4 is the bases of your pack. Currently my base pack weight will be in the 9 to 10 pound range with the big 4 taking roughly half of that weight. I am a firm believer that with a lighter pack I will be able to hike further with more efficiency and less pain. However all of this fancy equipment would be useless without the knowledge to use it properly and proper backpacking skills. These skills are essential to provide safety and efficiency in the backcountry. It has taken a while for me to get to this point in my gear setup and I’ve honed in on to what I actually need out there. What I carry may not be right for you, find out what you need to be comfortable and cozy out there for yourself. I was born and raised in Front Royal, Virginia. I attended Randolph College in Lynchburg, Virginia and received a degree in Environmental Studies. I am now exploring the west, and I've have worked seasonal jobs in Alaska, Utah, and Montana. Currently I am living in Mammoth Lakes, California and exploring the Eastern Sierra. I do lots of skiing in the winter and then backpacking and trail running in the summer. I completed the AT in 2014 and PCT in 2016, this summer my brother and I are taking to the CDT to finish my triple crown. On trail I go by Top Nach. That first picture: “My AT trap set up somewhere in Georgia”. That somewhere is Hawk Mountain Shelter. Most likely your first night on the trail. I remember staying at that one last year on my first night. 100% percent that is the shelter, as I pitched in that same area.